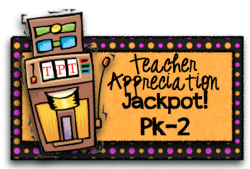 First, there's the Teacher Appreciation Jackpot, an amazing "blog hop" event involving over 130 bloggers! You can score over $600.00 in freebies! I'll be offering one of my items for free. Stay tuned to see which item I have chosen. Don't forget...you can fill your shopping cart early and then just hit "checkout" tomorrow! Happy Teacher Appreciation Week! Just found you and am now following!!!!! Glad you stopped by! I'm on my way to join your blog, too! :0) LOVE the name! Great blog, Just found it. I am your newest follower. I love your freebie! Thank you for sharing! Hopefully I can use this soon! :) I'm your newest follower! This is an awesome resource! I feel as though I always draw a blank when it comes to writing report cards (especially when I"m on the 20th one!). This will definitely come in handy - thank you! What a cute blog design! Saying hello from the giveaway at A Teacher's Treasure. Great blog! I'm your newest follower! Just stopping by to say "hey" from the giveaway at A Teacher's Treasure! love your blog! Saying hi from the giveaway at A Teacher's Treasure!